A few smart money managers seem to agree that, in investing, the defense is at least as important as offense - if not more so. I believe most investors make the mistake of trying to beat the average returns of the market and forget to goal-set and manage risks. I offer two strategies that should help increase the predictability of a growth portfolio's performance in the longer term. 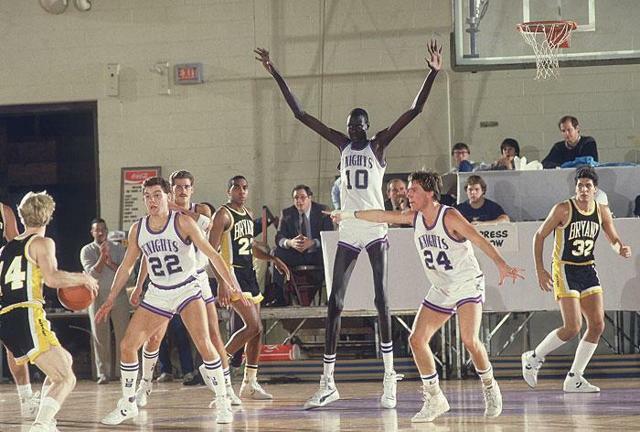 Defense is 10 times more important than offense. You have to be very focused on protecting the downside at all times. These are the wise words of hedge fund manager Paul Tudor Jones. His mantra seems a bit counterintuitive, considering an enviable track record that has made him best known for delivering outsized returns over the past four decades. Rock-star fund managers aside, I believe that risk management, rather than the search for higher returns, is a substantially more important topic of discussion for nearly all retail growth investors. The difference between the two is subtle since risk and return are closely associated (think of the upward-sloping efficient frontier in modern portfolio theory). But knowing what to prioritize can make all the difference between a successful and a failed investment strategy. To explore the idea in more detail, let me first define what risk means to me. I have seen risk be elegantly described as "the likelihood of an irreversible negative outcome". This is why, for example, skydiving is usually considered risky: one single failure and the consequences can be disastrous. In the world of investing, however, risk is often equated with volatility - a concept that many investors have reservations about. Volatility, in turn, can be defined as "a statistical measure of the dispersion of returns for a given security or market index". In other words, using this simplified definition, risk is the probability that a stock or portfolio may not produce exactly the returns that an investor expects of it. Risk is very simply the likelihood that an investor will fail to achieve his or her financial goals, whatever they may be. For growth investors, therefore, risk may be the probability that one will not be able to retire when he or she originally expected to. For a retiree, risk can be thought of as his or her inability to generate enough income every month to pay the bills or the possibility that the investor might use up all of his or her savings faster than predicted. Keep this concept in mind, as I will later explore how thinking of risk this way can help to shape possibly better investment strategies, using a simple example. Not being able to retire comfortably, buy a house, or afford the costs of living during retirement age seems highly undesirable. Therefore, if the reader agrees with my definition above, then risk should be minimized as much as possible, within reason. Of course, avoiding risks altogether by holding cash under the mattress and hiding under a table sounds safe, but may very well be a recipe for failure - suggesting that there is a "happy medium" to be aimed for across the risk spectrum. In my view, to find a tolerable level of risk, investors need to start with step one: having a clear understanding of their financial goals. It's like working a math problem backwards: establish the solution to the problem first (e.g. to own $1,000,000 in my brokerage account in 20 years) and work back through the variables, including initial investment and acceptable rates of return. This is where I believe most investors, particularly growth-biased ones, make their first mistakes. I invite the reader to browse around the web, check the discussion boards, and read some of the most popular articles (and their comment sections) on the best-known investment platforms out there: people are constantly trying to beat the market. It's usually all about topping the S&P 500 (SPY). In other words, the focus of attention too often converges towards returns, not risk. Here's something to think about that might help illustrate my point. Since 1928, the S&P 500 has produced an average annual return of 11.4%, dividends included. It is common, therefore, to hear investors say that, over the long term, growing a portfolio by a rate of about 11% or 12% per year is a good benchmark (to beat, that is). There have been 72 rolling 20-year periods since 1928 (e.g. 1928 to 1948, 1929 to 1949, 1930 to 1950, etc). A long-term investor planning to grow his or her portfolio for 20 years would have understandably expected to see annual returns in the low teens. But the actual performance would have met these expectations in only eighteen twenty-year periods since the late 1920s, or roughly one-fourth of the time. Maybe using real dollar amounts might help to reinforce the idea. A $100,000 portfolio invested for 20 years at the all-time average market return rate of 11.4% would have grown to $859,000. But in the worst-case scenario, the same $100,000 investment made in early 1929 and held for twenty years until the end of 1948 would have turned into only $299,000 (by the way, those who invested in 2000 at the peak of the dot-com bubble hoping to withdraw their money next year will suffer similar consequences). The sizable gap of over half a million dollars in ending asset value of a relatively small initial investment of $100,000 is basically the difference between a potentially comfortable retirement at a reasonable age and possibly ten extra years of hard work to make ends meet later in life. Notice that the villain, in this case, was not the expected return of the S&P 500, which presumably was rich enough, but the significant risk that the equities market might fail to produce the desired outcome even over the very long run. I suspect there is a general misunderstanding about the relationship between risk and return among investors that is very subtle. Modern portfolio theory suggests that, in an efficient market, higher risks should command higher expected returns - therefore, high risk and high return are thought to be a good thing in the long term. But "expected" is the key word here. There is absolutely no guarantee that a riskier investment will produce the mean expected results in the end. And when it doesn't, the consequences can be dire. Being comfortable with the less-than-ideal scenarios (a.k.a. understanding the risks) is crucial in setting the right expectations about reaching one's financial goals over time. In a perfect world scenario, highly-talented growth investors would be able to find a high-return investment strategy that guarantees that their financial goals will be met. Unfortunately, achieving high returns without any risk is unrealistic. But controlling risk as reasonably as possible while still maintaining returns at desirable levels is possible. I have previously discussed what is probably my favorite strategy for doing so. Back in 2016, I reviewed Bridgewater's "All Weather" approach to producing consistent results each year with less exposure to sizable losses - what would eventually become the foundation of my Storm-Resistant Growth philosophy. The graph below illustrates how Ray Dalio's do-it-yourself, multi-asset class portfolio would have performed since 1985 (I substituted 7.5% allocation to commodities with precious metals due to lack of reliable data). Notice that the balanced approach has historically produced much better risk-adjusted returns and significantly higher lows than a pure-equities strategy. Look at the blue line above and notice how this 9.2% CAGR portfolio climbed smoothly over a very long period of 35 years. An investor that, back in 1985, wished to grow his or her assets for retirement at a robust high-single digit annual pace with minimal margin for error (a very tall order) would have, in fact, succeeded using a multi-asset class, diversified approach. Of course, I should note that this has been true for the past 35 years - but may not be so for the next few decades. Although looking at historical data is a good way to better understand how an investment strategy may work in the future, results could certainly be different going forward. Let's use a very simple example. Assume that an investor has $1,000 at some point and wants to invest the funds for a short period of three years. She chooses to be exposed to minimal levels of risk and sets the goal of "growing the asset as much as feasible, but ideally without having lost any of the initial capital by the end of the investment period". Common sense says that the investor should not put her money in the equities market, given her conservative risk profile. Some might even think that she would be irresponsible to hold anything but short-term Treasuries that currently yield a bit over 2%. The idea here is to prevent sizable losses when they occur while benefiting from the eventual spikes in the stock market. The conviction, which to be fair could prove wrong under "perfect storm" conditions, is that stocks will very likely not free-fall for 24 to 36 months - even during the historical Great Recession, equities tumbled for "only" 15 months. For as long as the portfolio is protected from disasters, it will have a chance to recover before the end of the third year, which in this particular case is the investor's investment horizon. The chart below depicts how the strategy above would have fared against the S&P 500 since 2006. I am using this start date to ensure that I am analyzing a "normalized" period that includes a severe recession; a strong bull market; the malaise of 2007 and 2015; and the late 2018 bear. I was a bit impressed to see the Capped Loss strategy produce slightly better-than-average absolute returns over the whole period but not at all surprised by the much lower standard deviation. 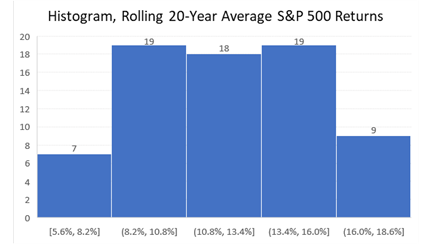 More importantly than volatility, however, is the fact that the strategy's worst rolling 36-month period (remember that, in our example, the investment horizon is three years) produced highly acceptable cumulative returns of -0.8%, while the S&P 500 dipped by as much as -24.6%. The histogram below helps to further illustrate that by managing risk and not by simply pursuing higher returns, the investor, in my example, would have achieved her financial goals ("to grow the asset as much as feasible, but ideally without having lost any of the initial capital by the end of the investment period") in 117 out of 118 rolling three-year periods since 2006. On the other hand, a plain investment in the equities market, without much concern for risk mitigation, would have failed by producing negative returns 19 times - sizable ones, in many cases. An investment in short-term Treasuries would have technically met the goal as well, but with a significantly lower probability of producing returns above low-single digits per year. The most conservative of investors might be satisfied with passing up returns for the absolute certainty of risk avoidance. 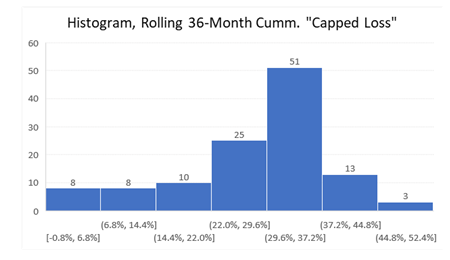 But keep in mind that, using Capped Loss in this specific example, the investor would have most likely produced cumulative returns of 30% or more over three years (about 55% of the time, refer again to the histogram above) while being pretty well protected from the risk of not achieving the financial goals. Readers can access the back-up file supporting all the calculations above by clicking on this link, and even do sensitivity analyses using different stop-loss limit assumptions. For example, check out how the results above would have been even better using a 1% month-to-date floor. 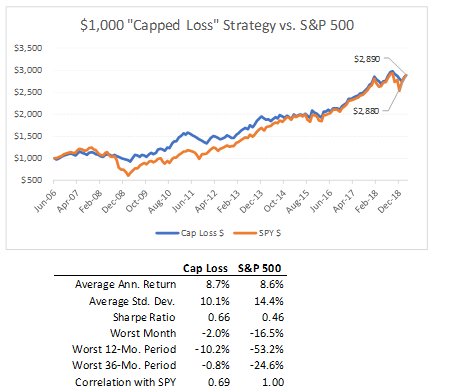 Regarding Capped Loss, I should first warn that the approach is supported by a back-test of historical data, and future performance might not mirror past results. Depending on the behavior of the markets, the Capped Loss strategy could certainly produce undesirable results. For example, a market that consistently dips below the stop-loss level only to recover later, month after month (a rare occurrence that could conceivably happen), would certainly hurt the portfolio. But again, the main message here is one of risk acknowledgement and mitigation and not one of complete risk avoidance. Second, the Capped Loss approach would likely produce a number of trades that a buy-and-hold investment in Treasuries, for example, would not. Over the 2006-2019 period and assuming a 2% monthly floor, for example, a trade would have been needed every five weeks, on average. In the case of small portfolios held at brokerage firms that charge a trading fee, the benefits of the approach could be offset by the costs of more actively managing the portfolio. Trading frequency is much less of a concern in the case of larger portfolios or those held at no-fee brokers, including M1 Finance and Robin Hood. Lastly, adaptations to the Capped Loss approach would be needed depending on each specific situation - i.e. time frame, risk tolerance, liquidity needs, etc. For example, should the investment horizon be much longer than three years, the stop-loss limits could probably be relaxed even more, assuming that stocks will appreciate over the long run. On the other hand, very risk-averse investors may be better served by fully protecting the downside and holding low-yield cash instruments only, or at best using a Capped Loss strategy with very conservative stop-loss limits. Also, liquidity requirements (i.e. the probability that one might need to pull the plug on the investment and withdraw the funds) could impact the risk mitigation benefits provided by the Capped Loss strategy. In a market saturated by the tireless pursuit of better-than-average returns, I hope I have been able to encourage readers to think about the importance of risk management. "Zigging when others are zagging" does not only mean buying out-of-favor stocks but also thinking critically (and why not, creatively) about portfolio strategies that might help investors achieve their financial goals. "Thinking outside the box" is what I try to do every day alongside my Storm-Resistant Growth (or SRG) premium community on Seeking Alpha. Since 2017, I have been working diligently to generate market-like returns with lower risk through multi-asset class diversification. To become a member of this community and further explore the investment opportunities, click here to take advantage of the 14-day free trial today. Disclosure: I am/we are long TYD. I wrote this article myself, and it expresses my own opinions. I am not receiving compensation for it (other than from Seeking Alpha). I have no business relationship with any company whose stock is mentioned in this article.